Cap't Ken is Transport Canada Certified and has been piloting the waters of the Great Lakes for more than twenty years. First Mate Jette has taken the Marine Emergency Duties Course and is Marine First Aid qualified. During the last seven years Cap't Ken and First Mate Jette have cruised their vessel "Stress Free" over 30,000 miles. 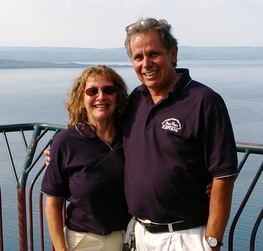 Their adventures have taken them around all the Great Lakes, a 7,000 mile circumnavigation of the Eastern Seaboard of North America, a number of trips down the Atlantic to the Florida Keys and the Bahamas.